How exactly does that make her a “hero?” Obviously, it doesn’t. It doesn’t even make her a good role model. Remember US Airways Capt. Chesley Sullenberger, who landed his plane full of passengers on New York’s Hudson River after his engines conked out? 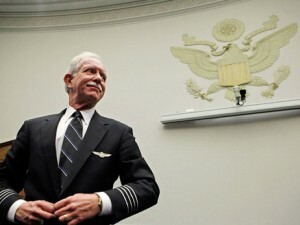 Sullenberger was quickly labeled “hero”–a term he himself says is not appropriate. Once upon a time I served in the U.S. Army. I did my job and did it pretty well as my various awards and eventual promotion to Sergeant attests. But I was no “hero.” I volunteered, I did my job and I left with an honorable discharge. When a soldier, marine, airman or sailor puts on his or her uniform they are just doing their jobs. Yet, today, we apply the word “hero” to all servicemen and women who serve in the armed forces. How often do we hear people refer to “our heroes in Afghanistan?” They are not heroes. They are servicemen and women and they doing their duty serving their nation. I sometimes wear a baseball cap when I go shopping. On the front it identifies me as a U.S. Army Veteran–a fact that I am very proud of. Sometimes people see that and thank me for my service. When that happens I often feel a bit awkward. Yes, I did serve four years in active duty and another four in the reserves. But I don’t feel anybody owes me a “thank you.” I volunteered for the U. S. Army and I did the job I was assigned to do. I am certainly no “hero” because of it. Against doctors orders he began an unsanctioned nightly training ritual in an attempt to redevelop his ability to walk. Climbing out of bed at night, Benavidez would crawl using his elbows and chin to a wall near his bedside and (with the encouragement of his fellow patients, many of whom were permanently paralyzed or missing limbs),he would prop himself against the wall and attempt to lift himself up unaided. “On the morning of 2 May 1968, a 12-man Special Forces Reconnaissance Team was inserted by helicopters in a dense jungle area west of Loc Ninh, Vietnam to gather intelligence information about confirmed large-scale enemy activity. 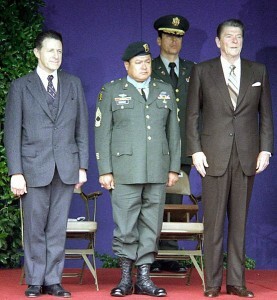 This area was controlled and routinely patrolled by the North Vietnamese Army. After a short period of time on the ground, the team met heavy enemy resistance, and requested emergency extraction. “Three helicopters attempted extraction, but were unable to land due to intense enemy small arms and anti-aircraft fire. Sergeant Benavidez was at the Forward Operating Base in Loc Ninh monitoring the operation by radio when these helicopters returned to off-load wounded crewmembers and to assess aircraft damage. “Sergeant Benavidez voluntarily boarded a returning aircraft to assist in another extraction attempt. Realizing that all the team members were either dead or wounded and unable to move to the pickup zone, he directed the aircraft to a nearby clearing where he jumped from the hovering helicopter, and ran approximately 75 meters under withering small arms fire to the crippled team. “When he reached the leader’s body, Sergeant Benavidez was severely wounded by small arms fire in the abdomen and grenade fragments in his back. At nearly the same moment, the aircraft pilot was mortally wounded, and his helicopter crashed. 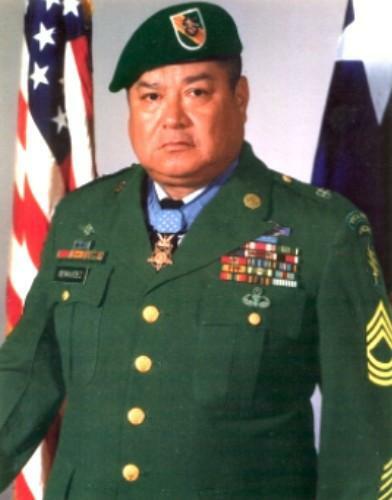 Although in extremely critical condition due to his multiple wounds, Sergeant Benavidez secured the classified documents and made his way back to the wreckage, where he aided the wounded out of the overturned aircraft, and gathered the stunned survivors into a defensive perimeter. The citation stops short of telling what happened when the helicopter reached its base. Benavidez was put into a body bag and as it was being zipped up, using what little strength he had left, he spit on the face of the medic to show he wasn’t dead.